The big secret that the holocrons revealed to Maul and Ezra back in “The Holocrons Of Fate” is that the way to stopping the Sith lie on a planet with two suns, and in the name of one Obi-Wan Kenobi. This is the most anti-climactic plot reveal in all the galaxy. Perhaps it was silly of me to assume Star Wars Rebels would let the holocrons’ secret be something more personal or specific to this show itself–something that would allow this third season to tell its own long-term story in its own way. We know that whatever path this show take concerning this specific truth can not, and will not, interfere with everything we already know about Star Wars. Maybe Rebels will approach the endgame of this arc with something truly unique or adventurous, but it still won’t matter in the long run because everyone already knows the ending–or the beginning. You know what I mean. That Star Wars story is already known, but what could be interesting is Ezra’s place in it. “Vision And Voices” focuses on the young apprentice, his visions of Maul haunting his mind, and the journey to Dathomir with Maul to unlock those holocron secrets dancing in their heads. It doesn’t quite resolve Ezra’s bratty behavior in past episodes, but it does allow for a clearer look at the teen, particularly his hostility towards parental and older figures. He’s lost and confused, and he wants to earn his place among other, more mature, more respected rebellion leaders. What better way to do this than discover the ultimate way to stop the Sith and save his friend? It’s selfish, sure–but it’s genuine. If the season wasn’t so episodic, it probably could have developed Ezra’s resentments and fears with more heft. So yes, it’s tough to watch Ezra agree to go off with Maul–it’s a monumentally bad idea, regardless of the fact that Maul can reveal their base’s location to the Empire–but I get it. Ezra isn’t exactly in a great mental state to begin with anyway, and that’s not including his insecurity and frustration. Maul managed to infiltrate his mind, making the young kid see visions of him, causing him to pass out and attack fellow soldiers. (An aside: I am SO glad they didn’t spend half the episode with Ezra denying he’s seeing visions and trying to figure things out by himself. That would have been the worst.) Ezra still tries to play it tough, but it’s clear that there’s a problem. So Kanan takes Ezra to Bendu, who does… nothing. I’m not understanding the purpose of Bendu, and I don’t think the show is either. It’s here that they confront Maul, and it’s here that he and Ezra agree to fly to Dathomir for the answers. Sabine smartly placed a tracker on Ezra, and she and Kanan follow them. There isn’t much to analyze in the first half, really: just good, solid plotting and pacing, no forced humor, and intriguing character decisions. It’s a low bar, but Star Wars Rebels has had trouble clearing it in the past. This would explain a lot of Maul’s decisions here. He could have left Ezra in that temple after they drunk the potion and extracted the truth, but he protects Ezra from the Nightsister spirits and also helps them escape. He also, keenly, left the possessed Sabine and Kanan in order to compel Ezra to join him. Ezra refuses, and Maul doesn’t strike him down. He just leaves after enunciating Ezra’s full name. It’s a telling moment, I think. 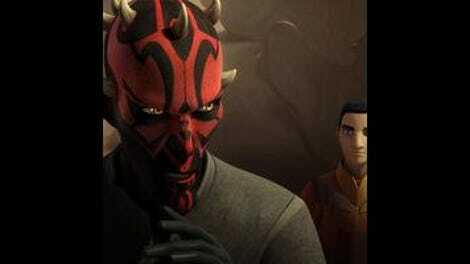 Maul respects Ezra in a dark, twisted way, and I hope to see more of this perverted dynamic in the future. Ezra then proceeds to rush back in and save both Sabine and Kanan with some quick thinking and some slick Force moves. The fight has some hiccups (what were the spirits waiting for between releasing Kanan and before possessing Ezra? ), but it was creepy and engaging. Straight-forward Star Wars Rebels episodes are the strongest ones, and here’s hoping they continue this for next week’s fall finale. Okay, quick primer: The Nightsisters are a sect of witches who can use the Force in a more mystical, magical way than the Jedi. Dathomir witches are the matriarchs of the planet over their male counterparts, of which Maul was a member. Feel free to correct me if I made any mistakes, and by all means, please elaborate on the details of all this! I don’t know why it took Ezra so long just to destroy that altar. 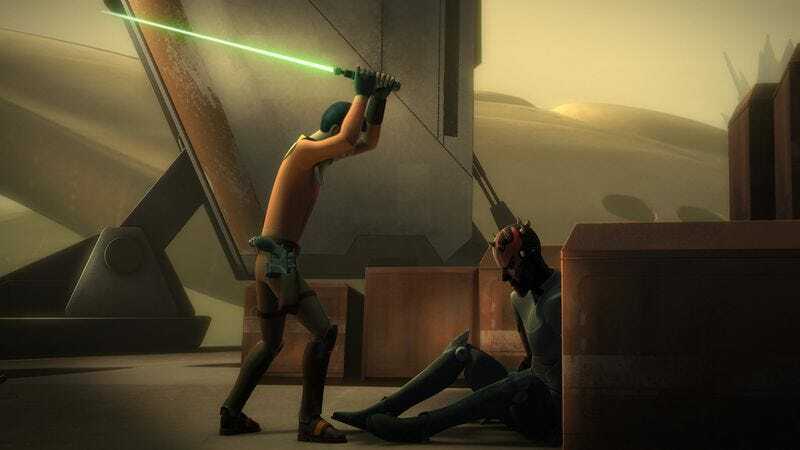 I get why Maul didn’t (he was 100% okay with keeping Sabine and Kanan possessed), but that should have been Ezra’s goal when he rushed back inside. I wonder if destroying the alter while Sabine and Kanan were possessed would have killed them? If so, that needed to be clear in the script somehow. Seriously, though: Bendu is pretty useless.